Following on from the introduction on ANPR parking enforcement cameras at Market Street in Wellington, motorists who leave their cars at a town centre car park are being warned to expect tickets. Office workers around Rampart Way have been using Staples car park to leave their cars for the day as car parking spaces for the offices in the area are in short supply. 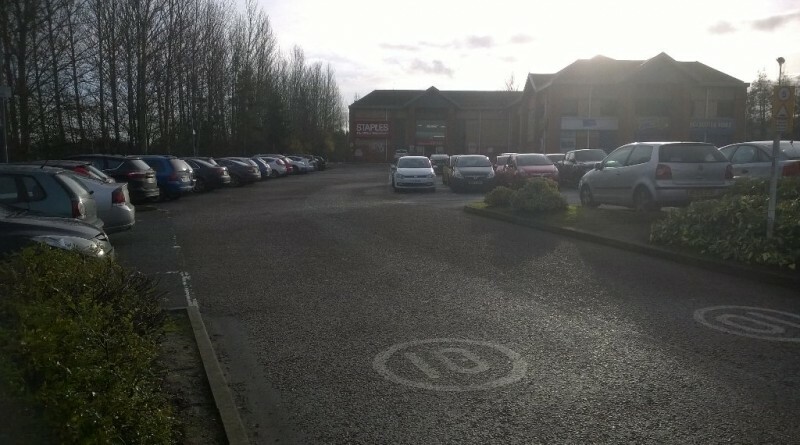 Even though Blockbusters has been closed for years, and there are only a handful of customers in the Staples store itself, the car park is often full, with even the staff struggling for spaces. In the area around Rampart Way, the Park Inn has been using this system for a number of years. Residents and visitors to the hotel are asked to leave registration numbers to prevent tickets being automatically issued. According to a member of staff, potential customers are seeing the car park full and are choosing not to visit the store, having an adverse effect on trade. The cameras at Staples car park are due to switched on soon. Clearly what Telford needs to support its growing and commuting population is more cheap parking. Not “enforcement cameras”! Free parking for the Town Centre was once Telford great strength for its shopping centre attracting buyers and providing income for workers here.